In the Ivory Coast, we faced two problems common probably to most other mission countries: first, unity among the missionaries and second, unity between the missionaries and the members. I want to share a deep experience we recently had, in which we achieved a breakthrough in this area. I was not the original missionary to the Ivory Coast, but arrived there after I had to leave my original country. When I came to the Ivory Coast, I found no members, just the three missionaries, and they were barely on speaking terms with each other. They had lived separately for a time, but by the time I arrived they were living together and making an effort to unite, but facing many difficulties. In the United States, I had had many very good experiences with the Japanese members on the MFT and IOWC, and I respected them very much; so I felt that the two sisters should make more efforts to follow the Japanese brother, even though he had not lived in our family that long and seemed a bit strange in his nature and way of doing things. Since both sisters were physically and spiritually quite young, I tried to encourage them to unite with him and even give him the position of central figure, because without that, he could not possibly function. For a time, the situation improved and he began to change a bit, but then a lot of missionaries came from many other countries. At one time, there were 12 missionaries, some six Japanese and six Westerners, and a lot of trouble started. By that time, it was almost impossible to control the situation, and resentments started developing, creating divisions based on East and West differences. We could not understand each other and we approached things very differently. Misunderstandings multiplied, and each group felt that the other was talking behind their backs. Small groups would go out together; one faction would sit in a room at nights talking in Japanese about the other faction, and vice versa. Even though some of the missionaries made efforts to try to bridge those divisions, it was not effective, because of the accumulated resentment. Some of the missionaries who came from other countries had arrived with a history of unity problems, and the Ivory Coast inherited it all. Moreover, some of the missionaries confided in the members about their unity problems and criticized the other missionaries. Some of the accusations were really awful. So not only were there unity problems among the missionaries, but it became difficult for the members to respect the missionaries, any of the missionaries. One missionary especially was always criticizing the others in front of the members. Respect for the missionaries gradually eroded. Eventually, there was a big change, and a lot of the missionaries were sent to England. All of a sudden, there were just three left in the Ivory Coast, two Americans and one German -- no Japanese at all. And I became the central figure. I inherited a center of about 15 members who were full of resentment, and the other two missionaries and I were also quite weary of the Japanese. I, who had been telling everybody they should unite with the Japanese, was reluctant to welcome Japanese missionaries to the Ivory Coast, because from my own viewpoint I had been deeply hurt by them. Anyway, Judy, Monique and I started to work, and it was not going so badly. But then another set of missionaries came to the Ivory Coast from their originally-assigned country. For the first time in several months, we had a Japanese missionary again. We thought we had gotten rid of them! This brother, Teruo, was the kind of person who talked constantly about unity and the necessity of uniting. We had already been through all that, we replied, and we had no desire to unite. We just thought that they could work in their own way and we could work in our. "Let's not try again," we thought, "it all failed in the past." But he really made an effort. Over a period of several months, he really pushed this point. However, the more pressure he exerted, the farther I tried to retreat. "Just let it alone," I cried. I did not want to go through the same things we had experienced before. Not that I objected to uniting with him in particular, but in my heart I was afraid of the same kind of problems recurring. However, Teruo just persevered with a humble heart. One day I found in Time magazine an article about Japanese nature. It described how selective the Japanese are and how they don't want people from other countries to stay in Japan. I thought to myself, "You see, here it is, right here in Time magazine it explains what we have been experiencing." And with that attitude, I showed the article to Teruo. He took the article, read it and completely closed up. He didn't say a word. I knew I had done something wrong. About five minutes later, I looked over and saw tears rolling down his cheeks. So I said, "Gee, I'm sorry if I said something wrong." "Do you really think that all Japanese are like this?" he asked. "If you really believe this, I don't see any hope." Anyway, I was really shocked at his sensitivity, that such a thing would hurt him. I thought all the Japanese were immune to being hurt by a Western member! So I began to take a second look at my own heart and attitude. For his part, Teruo continued to serve very humbly and to bridge the gap between us. Little by little, trust was being restored. I think it was at that moment I saw how really serious and sensitive he was and how hurt he had been by that one statement. So I began to make an effort to open my heart. Somehow, Judy and Monique followed. I began to witness to them about the sincere efforts he was making, so they also began to try to trust him. Through his humility, service and sensitivity, the problems of the past gradually began to be solved. It was not a kind of thing. you could sit down and talk about. It was something in the heart that had to be restored. It took, I think, somebody as humble and serving as Teruo to be able to persevere until that hurt was erased and confidence and trust could be restored. I don't know how he did it without being wounded, but I guess he kept his heart centered on the mission. Even at that, his focus was not just the mission, but he was sincerely concerned about each one of us as individuals; that, I think, was what helped us to overcome. Through his perseverance and humility, that gap was overcome about two years ago. Today, the four of us have a very close and deep relationship. Some of the other Japanese members could not understand the value of such a quiet, internal person as Teruo, but through his service, he accomplished more than anyone else in that country had ever done -- he restored the past. "He has very good heartle," Rev. Kwak observed on one of his visits, and he entrusted him with a major responsibility. For Rev. Kwak, to say someone has good heartle is the highest compliment he can pay. After this step was taken, we could start to try to mend the relationship between the missionaries and the members. Before, even if we had tried, it could not have worked out, because we were still not united. To try to talk about love and unity to the members would have been hypocrisy. The members felt this, even though nothing may have been said directly. We did not have any authority before them until we could solve our own problems. If the missionary problems had not been made public, maybe we would not have had to go through this course. But because they were well known, we had to find a way to make public restoration. Through these experiences, I could feel the meaning behind Father's statement that it is so much easier to create than it is to restore. To create Adam and Eve did not take God such a long time, but to restore them required 6,000 years. Once evil has entered, to remove it and clean things up is really, really hard. We tried serving and unconditionally loving the members, since we could not begin with a high standard. Perhaps we could have kicked out the members and tried to start anew with people who had not been involved in the past. But we chose to try to restore the members we had, even though it was the longer course, for only in this way could we restore the whole foundation of the past. Our course was hard. We had to receive a lot of accusation and criticism and in return give unconditionally. We also had to demonstrate unity in front of the members and show that we respected and loved each other. We refused to listen to any member criticize another missionary. Our desire to protect each other resulted not from some horizontal feeling but out of respect for the position of the missionary. The members kept looking for ways to divide us, as was their custom. A long time passed before they realized that they could not repeat what they had been doing in the past. We tried to give advice and guidance, but we often received a lot of criticism and accusation in return, from members who had never learned heavenly tradition. So for a couple of years we concentrated on making a foundation of unconditional love, before we could be strong and clear things up. I don't know if we waited too long or not. Finally, we were able to form a nucleus of team leaders who could grasp what we were trying to communicate. Still, our unity was not perfect; past resentments lingered on, and they could not fully understand our heart in the past, because we had never really talked openly about our problems. With these seven team leaders we held a four-day meeting. One member had received a revelation that the foundation of substance had never been secured in the Ivory Coast, even though we had many members. Without such a foundation of substance, nothing could go well. Therefore, if we had to face opposition or persecution someday, everything would fall apart. In his revelation, he received that the Ivory Coast members had not yet fulfilled their own responsibility to unite with the missionaries, who were the representatives of True Parents. This member told several other members of his revelations, and that really helped to break the ground. On the basis of this revelation, we took the team leaders out into the bush for four days. "Let's just open everything up," we said. "Please say anything you want, please bring up anything you wish from the past, present or future. Get it all out, and let's handle it once and for all." So one by one, we let the team leaders talk and express their hearts. We also shared our hearts as openly as possible. There was nothing we didn't let them talk about without our getting hurt or upset. They spoke and we spoke -- for four days straight. We took them to various places and we ate in nice restaurants, spending a lot of time and energy, trying to squeeze out all of the past, even from our own hearts. At the end, a very deep understanding emerged. It dawned on them, for example, that we had unity problems among ourselves. We didn't lay the blame on the other missionaries, but rather took responsibility for everything. We didn't understand so much about what we were doing, we told them, but that was how we were sent out. We had to learn by doing. Maybe we made mistakes along the way, but we were and still are trying. If we all make efforts, we can learn together. We had to take a humble position and let the members express their hearts. They could understand that humility, and instead of jumping on it, they were very kind and sensitive. Realizing the true situation of the missionaries, they began to feel sympathy, not just for us but even for all the missionaries who had been in their country. One missionary in particular had caused a lot of havoc, but even towards him the members began to feel sympathy and compassion, understanding that he had come without any training or clear understanding about what to do. Still, he had come on faith, and God could love and respect that, even if he made a hundred thousand mistakes. In this way, a mature attitude began to develop among these team leaders, but it was only as a result of a dialogue. As we explained our heart, they responded, "Oh, gee, you felt like that? I didn't realize it." We did not try to set ourselves up in some position. At the end of four days, they began to feel repentful. "We now realize that as Ivoirians, we have not accepted our responsibility," they confessed. "We had been saying that because of the missionaries, we could not do well. Now we realize that given any situation, we could also have fulfilled our responsibility; there is really no excuse. We want to restore that." At the end of the workshop, these team leaders decided to do a joint seven-day fast, ending with an all-night prayer vigil. Afterwards, we decided to hold a 12-day workshop for all the members. Akaishi taught the Divine Principle for five days. During the evenings and for the final seven days, I taught internal guidance based on Mr. Sudo's lectures. I think the members expected some kind of judgment from us. They knew we had held this meeting with the team leaders and had made unity with them, so they were kind of afraid that we missionaries and team leaders would then jump on them and accuse them. We did nothing of the sort, but rather tried to take a humble, loving attitude, teach the Principle and the internal guidance and accept the responsibility for everything that had happened. During the first couple of days, the members held back, but afterwards, they began to open up. 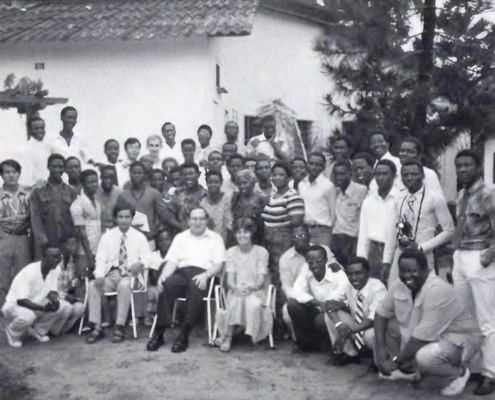 The fiat evening I taught "The Purpose of a Religious Life," a lecture developed in Zaire. The purpose of a religious life is to bring us back to God, the lecture emphasizes. Without sacrifice, this is impossible. Therefore, we have to realize that the religious life means sacrifice, and not rebel against sacrifice but anticipate it. This set the theme of the workshop. On the sixth night, we talked about Cain and Abel problems. That was the lecture that started at 7:00 p.m. and ended at 2:00 the next morning -- seven hours without a break. Everybody was wide awake. We talked about Cain and Abel from everybody's viewpoint, from God's viewpoint, from Cain's viewpoint, from Abel's viewpoint -- what Abel has to do, what Cain has to do, what God wants both of them to do, and what God's problem is in the Cain and Abel relationship. The members were somehow touched by the fact that we talked about Abel's shortcomings -- Abels that are arrogant or Abels who don't fulfill their responsibility. When they felt we were judging ourselves, they felt more open to judging themselves. All of a sudden, some spirit moved the members, and they started repenting and confessing publicly their Cain/Abel problems, Adam/Eve problems, past misunderstandings with their team leaders or missionaries -- all kinds of things. This meeting was not at all planned, it was just going to be a two-hour lecture. During the question period following the lecture, a flood of things came out. God's spirit was working; we never could have tried to make it happen. It came, I believe, on the foundation of those four days of meetings with the team leaders and the conditions they made. At 2:00 we prayed together for 21 minutes. People were crying very deeply. At 3:00 still nobody wanted to go to bed -- the whole house was tingling, it was really beautiful. During the 12 days we also spoke openly to everyone about our family problems, what had been going on in the centers and why things had happened. Many of them, not being older members, had not comprehended what was going on. They had just inherited the resentment nourished by the older members. But their resentment was directed not at the missionaries but their team leaders. What we had created in the Ivory Coast was a tradition of resentment passed on from one level to the next. So we had to solve the resentments at each level. There was one older member, for instance, who just could not change; but we could not be strong with him until we had laid some foundation, for if we had, the other members would have supported him more than us. We would not have had the spiritual authority to clear things up. During the workshop, each member came for an interview with Teruo and me and confessed many things. The workshop turned out to be a repentance workshop. At the end, we gave new missions to everybody, keeping them in the main center for the time being, to break old habits and, more practically speaking, to build up the right direction. When we gave strong direction, everyone welcomed it, because of the foundation that had been laid. I learned more through this one experience than I had throughout my whole Principle life. I found out the meaning of a foundation. Father did not make the same mistakes we did in the beginning, but I could understand how he had to give love and service until people could trust him. On the foundation of those early members, Father is now able to speak strongly and give true direction. We, however, could not walk in and give strong direction without a foundation of people who were willing to die for us. That foundation must come from loving and serving unconditionally. A lot of events had led up to the four-day workshop with the team leaders, but it was all God's guidance. Even before this member had received the revelation, the missionaries had begun a 21-minute prayer condition each night for the members, and I really feel that through this condition God could guide the situation bit by hit. Perhaps one of the reasons why it took so long was that we as missionaries had to pay indemnity for our past failure to make a good foundation. We had to go through a course of receiving a lot of accusation and criticism, until the time was right when we could move and set a-true tradition and true standard. I think it is possible to set that standard in the beginning, as they did in Zaire. I think that was one of the reasons why the Zairian family has grown so much. What impresses me so much about Zaire is this foundation of unity between Gregory and the other missionaries and the members. I know that they had unity problems in Zaire, but they were never made public until after the foundation was already made. Because the missionaries did not publicly fight, their disunity was not inherited by the members. Furthermore, a nucleus of missionaries, centered on Gregory, did unite, and on that unity, they began to set a foundation in the country and try to find good members who could inherit God's tradition. From the beginning they had a very high standard and demanded a high standard from those who came to the center. People could not, for example, move into the center and still continue their way of life in the outside world. Center members had to have attended both weekend and seven-day workshops, pass a Divine Principle exam, give a donation of money to the church, and receive the approval of the missionaries. To live in the center was not something a person could obtain easily. So from the beginning, the leaders could talk in a true traditional way. They had missionary unity, and the one who did not unite eventually moved outside of the center. Because of this high standard, members learned the true way of life, and on this basis, such a beautiful foundation was laid in Zaire. Even today the members love and almost worship Gregory; he gives out constant love to the members, expressing his love by his way of educating them. Gregory is also very open. If a problem arises, he will hold a family meeting and discuss it openly. He does not hide behind a facade of being a central figure. He is strong about the meaning of central figure, but in a very loving and parental way. So the members really have a deep feeling for him. Zaire was really chosen. One king embraced Christianity and had all his village converted; he sent his children to Portugal for training. From that area, the prophet Simon Kimbangu began to teach. The Zairian people are very alive, vital and strong. They don't do anything in halves. That can be bad, of course, if it is misdirected, but good if it is well directed. I have tried to study to Zairian family because it is successful, and I want to learn from them. From what I can figure out, the Christian foundation, the nature of the people and the fact that the missionaries also laid a good foundation all contribute to the success of the Zairian family. Several Zairian members came to the Ivory Coast, and they were hurt when they saw that our members were nourishing resentments. The Ivoirian members, on their part, were shocked at the reaction of the Zairians. So this exchange of members was very good for us. There is a really genuine membership in Zaire. people who sincerely believe in the life of sacrifice, for example. They are not complaining, waiting for the day in which they will no longer have to lead a life of sacrifice. They aren't longing to receive the Blessing, thinking that by it they will be released from sacrifice. They have been taught that they must live this way for a long time -- not because Gregory makes them sacrifice, not because they don't have enough money -- but because they understand that through this sacrifice, they will find God. They have a desire, each one of them, to lead that kind of life. In the Ivory Coast, we eat rice and sauce three times a day. The sauce contains no meat or fish; it is very simple. But because we were eating three times a day and not just twice a day as they do in Zaire, the Zairian members thought our meals were quite elaborate. When American members come to our country, they complain about the food; when Zairian members come, they think it is great -- too much. Our actions reflect our fundamental attitude about the life of faith. Sometimes I sense that members are trying to persevere until the life of sacrifice is over, without really understanding its value, without seeking to make contact with God through it. But persevering and waiting until the sacrifice ends is a kind of passive attitude. In Zaire the members are leading a life of sacrifice in an aggressive way. "By leading a life of sacrifice, I am going to meet God," they tell themselves. "Where is He?" And they go out and find Him. Therefore, they are full of vitality. They are so full of life and determination, I feel we could send them out as missionaries all over the world. I feel that Africans tend to understand the value of sacrifice better and more deeply than Americans do. Once Africans have the right education, they can all become like the Zairian members. They are very heartistic and full of zeal for God and True Parents; it is very hard to cut them off. Our members ask, "Why can't Africans become missionaries?" I feel that in the future they will. All of their lives they have been in the position of receiving from missionaries. Now they want to give out, not just to receive. And I think they are qualified to do so, as are the Korean people, because of their understanding of God's suffering heart. Africans have their problems, but they are very pure. There are of course chapter II problems in Africa, but generally they are very innocent; they are not so twisted and deformed spiritually as we Americans often are. Africans are more accustomed to doing things for their family. They are not so individualistic or selfish. Father once described purity as the absence of self-centeredness. Africans are also very spiritual. I don't know any African who is not convinced of the existence of a spiritual world, and perhaps because of that they can feel a lot of zeal. They can have real skin-touch experiences with God. They live close to nature and are very open and simple. Sometimes we Westerners are so complicated and intricate that God cannot get through to us. Father once said that the love of white people is the most shallow, the love of yellow people deeper, and the love of black people the deepest of all. Sometimes I wondered about that, because it didn't always seem that way, but I knew that Father had to be right. Upon reflection, I discovered that the African capacity to love and forgive is the deepest, because of the suffering they have under gone. Once their love is directed according to the Principle and nourished through many experiences with God, they have a deep capacity to love and forgive.